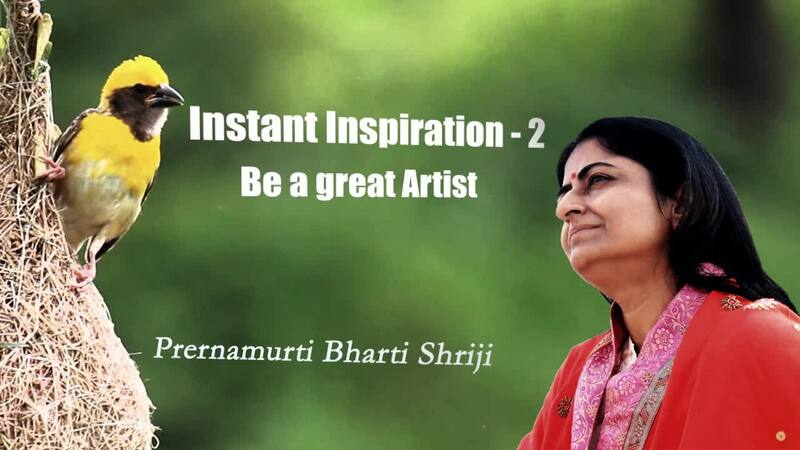 As name itself reveals, ‘PRERNAMURTI’ “an idol of inspiration” ,Prernamurti Bharti Shriji with an example of Bird and its nest making artistry explains to make best use of the artistic values given to mankind by the Almighty God. Prernamurti Bharti Shriji through her Benediction voice :”What a beautiful Architecture ?? had she ever gone for learning Architecture ? had she ever gone for reading Architecture ?? It comes naturally. She makes house significant and beautiful like a Tailor adding a second cloth for stitching. Similarly does she to make nest, this is art. Greater the man close to nature greater the intellect. It’s right, that birds made house same a like thousands of years ago, But.No need to learn it today, no architects, no institution has been defined for them. God is the artist. God has developed every living being with some or the other art. Unagreeable God has developed some property in every Birds or Animals. God-made creation is not without any property. Whatever few art is given to you by the artist(God) in the art work please introduce laudably as you took artistry. The nest making is also a property and one given to man is also a property.If you utilize the given art, so each person will be attracted towards you. The art will be utilized and you will be victorious in the art field. Will achieve success in the world. Simply some or the other property occur in every living being. Where multiple properties at once is found, that person is capable of leading. An attribute of God’s artistry. By honoring the art given from God is to make beautiful art into more beautiful. As there was no reduction in the nest caught our eyes was so driven to touch it, to decorate a flower. Because its beautiful specimen and made specific manner. Recognize your own art whatever God has given to you. The art of action off the streamlined deeds. Be the Best, Make Impressive Development”.